The Hudson Reed Grand Rigid Riser Kit with Shower Rose AM3602 has a 8" in diameter shower rose. 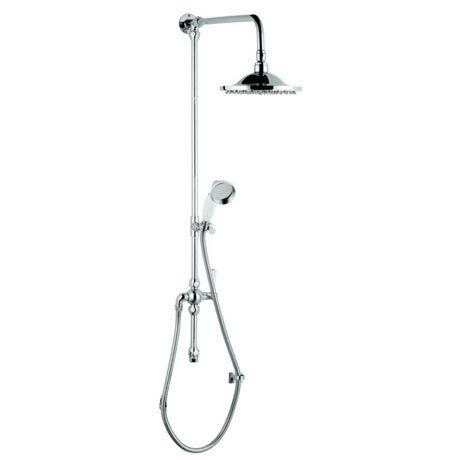 It has a built-in diverter so as to switch between the fixed head or hand held shower. All kits include sliding rail, shower hose and shower head. Hudson Reed's range is ideal for renewing the style of your bathroom affordably. Riser kits are supplied with adaptor for shower valves with 15mm (1/2" BSP) outlets. Hi Rich, this shower head is mounted on a ball joint so is adjustable. Thank you for your message. The Hudson Reed Grand Rigid Riser Shower Kit is a very good item, we have just had ours fitted and tried out and its a great peice of kit. The large shower head really works great.